Are these figures based exclusively on those transactons handled by CIREBA members, or do they include all property sales on the island? There have been a some successful developments where most of the sales were handled by the developer himself, and many private sales by owners wanting to avoid the 7% transaction fees in these hard times. Without more information, these figures probably fall under the heading of 'statistics' , which I seem to remember in the hierarchy of Truth, fall far below both 'lies' and 'damned lies'. Cool it with the realtor bashing guys. CIREBA has brought some order to the real estate industry, and realtors have enormous overheads in advertising as well as paying rent electricity gas etc. often without reward. Live and let live, we can all complain about the high fees charged all round in Cayman, it's just the cost of doing business in a very expensive place. Nonsense. Just open up the real estate industry to the cold, bracing winds of the free market. It’s always fun to read the industry leaders trumpeting their support for capitalism on the one hand and an outmoded, Stalinist price-fixing regime on the other. Come on, let’s hear you justify it to us mere mortals in nice simple economic and social terms. Bet you can’t. If you buy a property worth US$500,000 in the current market it's unlikely its value will increase much in the future (it's more likely to decrease if things continue as they are!). If the economy ever does recover, we won't see the huge leaps in value as we did before the crash. When you decide to sell the property (if you are lucky enough to find a buyer) you will have to pay 7% commission to CIREBA, plus more legal fees. That means, with the 5-7% stamp duty, 1% bank fees and 1% legal fees you had to pay to purchase the property (approx $80k), you are in negative equity right from the start. Most expats don't want to stay here forever so it's unlikely you will be able to turn it into an equitable property within a reasonable time frame. Why would anyone in their right mind buy a property here?! The purchase/sale fees need to be more realistic. Boy – denial is a disease that has spread throughout the entire country and seems to run rampant amongst all walks of life! A question for realtors. How does one build equity in a home when mortgage rates are 8% and house values are declining? Realtor – "That's not my problem as long as I get my commission." 20.22. 2% mortgage! Which bank? "There has never been a better time to buy"
Do not question the mantra. The mantra is all. To quote Brian Fantana in Anchorman talking about his cologne: "They've done studies, you know. 60% of the time, it works every time." I think people are selling and running because of recent increase in crime. I wouldn't buy a property here if my life depended on it! Are all the thumbs downs from real estate agents? Must be becuase I am with Kumah…you don't rent a deck chair on a sinking ship so why the hell would you buy property in a doomed country beset by infighting and prejudices, every project is opposed, XXXXX. Jenny from the block: This type of comment was made 40 years ago when I came here by people like you who found Cayman and Caymanians difficult to take/understand. A couple of Canadians I know sold out and went to Costa Rica which at that time was supposed to be the upcoming place. They were encouraged to do so by the late Dennis Foster who also went there. The Canadians eventually sold out at a very serious loss to themselves – I don't know about Mr Foster. Another big 'investment of the moment" was in the early 1980s Turks and Caicos. I refused good offers to get involved because I did not like the social climate and political goings on there at that time. Others may have prospered, I don't know. Those of us who invested in Cayman at that time and had faith are grateful we did. I am only sorry I could not at that time afford more. I think your Titanic/deck chair stuff is overdramatic although i accept we are going through one of these difficult times that we have had off and on over the last 40 years. Couldnt be a better time to buy! This so called report that Jermey Hurst so boldly put his name to is worthless. CIREBA is the real estate bully , They chagre high commission rates dictate to their members who just sit ther and take it. Futher more there is so much conflict on interest with this CIREBA , you have Broker owners sitting on the board of directors making rules for there members and when it suites them they can change so call rules. I must add that those rules that they make only apply to certain people and real estate companies in the association , no need to call names we all know the big wiggs . I still say it is CIREBA that is causing the most propblem with real estate on this Island. Its time Governmet step in an make proper rules and regulation for real estate companies to follow and apoint and independant board to over see. Again read between the lines, figures but not facts, make it real. Who gives a fig about million dollar properties selling…. Mid price and condos sales are at rock bottom… And 7% fees to realtors ….. putting people, already in negative equity, in hopeless positions. 7% may have been the only way to make a living back in the day, but now it is just plain robbery. …. See there… CIREBA has announced that everything is nice and beautiful in our little Garden of Iguanas. You know, if a fair price was asked for a property, could buy for cash tomorrow. Unfortunately, I just don't understand how US$500k can get me an incredible place somewhere else and only a piece of """"" here. What makes Cayman so special? is it Immigration? Is it the hatred of the locals and the arrogance of the expats? What's the deal? The Deal my friend… is that all materials have to be imported, skills are imported, govt. fees for permits are very high, there is no poverty line labour force , small Island land is in short supplyand therefore costly. Developer and land owner have to make some profit to pay back the bank's usurious rates and fees….all of the above and more so that uneducated ingrates like you can have a civilised existence…..That's the deal. They borrowed the person responsible for producing the governments budget to calculate this – explains everything. CIREBA are bound to talk up the state of the real estate market. Read the market reports by Kim Lund: same world, different planet! yeah! I knew it! Everything is beautiful!! Need to disregard the distorting effects of dart etc also. Sounds like BS to me. The rich are getting richer and the poor are getting poorer. Minus Darts purchase and then do a percentage. The same false accountability with Tourist air arrivals since 15 years also. And Jeremy has the nerve to put his name to such an article? Says a lot. tranaction number down……. that's the real hidden headline here….. cireba is always try ing to put a positive spin on things…. Positive and delusional are two different things. Great headline, I wonder whether there is a relationship between CIREBA's pronouncements and its members' cozy relationship with thePremier. This CIREBA article is a false indication of the market. The only reason for the increase is Dart's purchases. 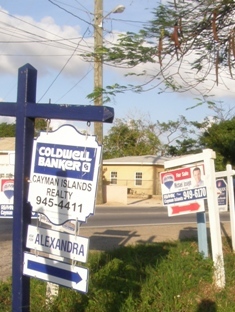 I am very concern when it comes to figures related to property sales here in the Cayman Islands. Under the current system, value of property is over rated more than 26% based onfigures from other destinations within the region. This eventually will cause a stag in the market when other supporting factors fail, resulting in a full crash, much like what the United States experienced. It is time that the government put in place a form of control over marketers that cause property selling price to be beyond that of true value, in order to protect long term interest of the Cayman Islands. I cautioned this article as good news. CIREBA saying that "the total value of transfers is up" just means that larger, more expensive properties sold. For example, was the Dart purchase of Stan Thomas's property included? One of Dart's purchases of a group of properties was US$124,000,000. That significantly distorts the figures. Has the value of specific properties increased and what is the reason for the overall higher figure for all property sold? I.e. has the value of land, say in Savannah, increased, held, or declined? Same question for every other property type. Are houses now more expensive, or less so? This data is useless and misleading without a bit further analysis and thought. Of course DART brought a bunch of property this year…. Property is being dumped. The real issue is what were the sales prices of these properties compared with last time they were sold – most cases – a lot less. Property is hardly being dumped. Well, maybe people who invested in inland condominiums built in mushrooming developments after Ivan are eager to sell now, since they can't rent them for a sum that would cover their mortgages, but I have been in the market to buy in the SMB area for two years and have seen homes I've viewed sold off to faster, higher bidders. Well-built homes, if they are in good locations and priced appropriately for the current market, are still selling — and some are selling very quickly by Cayman's standards. However, I would say that at least half of the homes I have seen that sold quickly were either not listed with CIREBA at all or were not 'officially' listed. The info was shared with a particular realtor privately who then forwarded it to likely clients without actually adding a listing to the website. Lets hope people are using the other resources available to them to buy and sell real estate instead of using the over priced real estate agents who's high comission charges are most detrimental to the market. True Pirates of the Caribbean! !